The good season has arrived and many are about to visit Bologna or another city in the Emilia Romagna region, maybe for the first time. What are the advantages of relying on a private guide? First of all a private tour is taylor-made, so you can visit the main attractions, but also those that are not found in tourist guides. 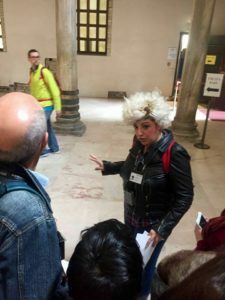 Therefore, you can experience the best of the city, maybe in a single day, discovering secret places or aspects, which only a local guide is able to show you. Only with a private guide you can better understand the past and the most authentic sides of a city. Wandering With Us offers you not only a fluent English speaking guide, but a qualified and insured LOCAL expert. You can immerse yourself in the past of Bologna, from the Romans to the Middle Ages, from the Renaissance up to modern times, because your guide will make you feel part of the history and the cultural scene. You will discover places and secrets of the city as you would do in the company of a friend, tasting local food and drink, and collecting memorable moments. If you are interested in art, you can also visit museums and galleries with an experienced guide, which will introduce you to the artists and their legacy, through many historical periods, giving you a pleasant and stimulating experience. Take advantage of our public tours, a viable and cheaper alternative that offers you a guided walk led with enthusiasm and professionalism. Our philosophy is to share with you our passions and the many surprises that the city is able to reserve, always focusing on quality and authenticity.